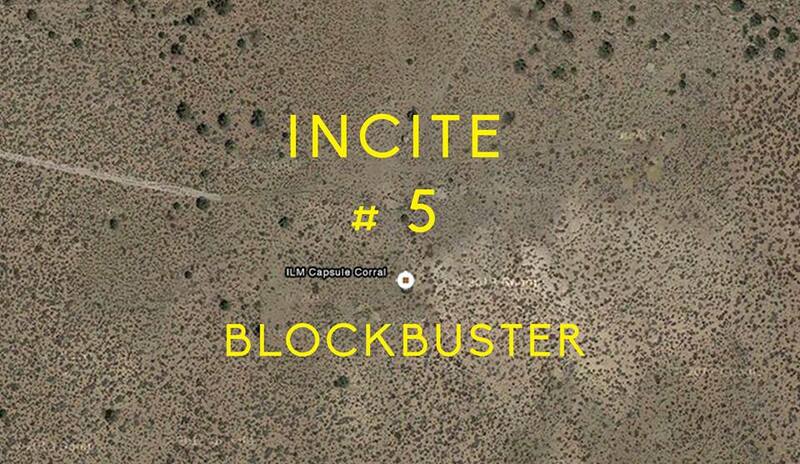 INCITE journal number five’s theme is “Blockbuster”. A central topic is simulation and entertainment in contemporary culture. The Game of the Future by Anna Ialeggio is about a collection of plywood Middle Eastern ‘everytowns’ built in the California desert near Barstow. The subject of the excellent documentary “Full Battle Rattle” (2008), this distributed collection of towns is operated by the US military and is used for role-play-based on-site training. The towns, Ialeggio explains, sport more or less everything, but in rather basic plywood and rudimentary form, that the US needs for its troops to pretend that they are already in the Middle East. Amy Sloper’s Lab Bags on the fall of film processing labs lovingly discusses the promotional illustrations found on the side of “lab bags”, those plastic bags that accompanied cans of film sent to and from processing labs. There are several illustrated. The witty and stylish designs speak to a time when film professional spoke to film professional about dependability and reliability of service. Now these illustrations are collected as precious ephemera of a disappeared historical moment. Lab Bags and its testament to this doomed form of industrial photochemical film culture is poignant indeed. The ghosts of old thus media thus fade, and new ghosts take their place. Our terra digitalis is a landscape itself molded by the intersection of the real, the virtual and that third conceptual “place “ where you go to get the officially sanctioned latest experience. INCITE nails it again with On Mimetic Polyalloy by Gregory Kalliche which takes a spotlight to the now legendary Bay Area based special effects company Industrial Light and Magic and its annual corporate bonding ritual performed somewhere in the desert. The ILM team forms a giant circle, presumably echoing Huizinga’s Magic circle or Joseph Campbell’s Hero’s Journey “Monomyth” circle. An emblem of Californian universalism to be sure. Then Kalliche explains that ILM members pour molten metal into cavities in the desert sand. The team-building metal-pouring gesture echoes visually one of the very first digital motion picture special-effects moments—the creation of the humanoid T-1000 Terminator in the film the “Terminator 2” in 1991. In this James Cameron sci-fi action blockbuster epic, a humanoid robot (whose default disguise among humans is as a sly police officer) is made up of liquid metal that can sample or replicate any object or life-form nearby, occasionally also dispatching them with edged or pointed weapons at will. In the title story Blockbuster, Roger Beebe chronicles his experience as a hip independent video rental store owner in a small town. As a customer loyalty incentive, he offered free rental if his customers were willing to cut up their Blockbuster video rental card and put the pieces of the card in a large glass jar on his counter. This active boycott helped to him prevail even long after the pre-streaming media version of Netflix did in the Blockbuster chain once and for all. Kevin B. Lee’s Premaking a Chinese Hollywood Blockbuster: Transcultural Flows and the Culture of Anticipation in “Transformers: Age of Extinction” is a comprehensive analysis of the ways in which the demands (perceived and otherwise) of the Chinese market have affected production and content decisions in the latest Transformers movie, particularly the depiction of the Transformer robot character Grimlock, shown as a metal T-Rex in the original animated 1980s TV series, who now resembles a Chinese dragon. In this latest Michael Bay blockbuster, Lee sees, in the film and its attendant publicity trailers, evidence of emerging hybrids. Each superpower, Lee argues, by seeking a commercial advantage via the use of the massive movie blockbuster form for its own ends, is inadvertently or otherwise, colonizing the others. Turing Complete User by Olia Lailina unpacks the role of coding in software use and coding skills. She helps frame the history of the user interface in a broader cultural studies and media archeological framework. Lailina cites Cory Doctorow who warns about the “Coming War on General Purpose Computation”. In short, devices and the ‘cloud’ services they rely upon assume and reinforce a world in which the user is less and less a subject of independent agency, but rather a passive subject facing an increasingly predetermined series of experiences that render him or her a more passive subject in someone else’s advertising-driven algorithm profit game. INCITE #5 covers a range of topics characterizing our current time as one of deep ambivalence and fascination with the effects of blockbuster entertainment on our collective psyche and visa versa. It’s a rich compendium of theory and ideas and comes at just the right time for scholars and movie buffs alike. There are pieces on everything from Hollywood’s ongoing effects upon our psyches, to the reality of illusion and superheroes. INCITE is clearly one of the most happening film journals today and reminds me of 21c, from Melbourne in the mid-nineties. It’s transnational, transcultural, interdisciplinary, and as in the UK, the digital and the real are starting to create some strange spin off hybrids. INCITE is tapping the zeitgeist energy beautifully. David Cox is a filmmaker, artist, writer and teacher based in San Francisco. He is a regular contributor to OtherZine and has been a member of the Other Cinema community since 1992. His films include Puppenhead, Otherzone, and Tatlin. He holds a Masters Degree in Animation & Interactive Multimedia (RMIT 2003) and a Bachelor of Education from Deakin University, Melbourne.